Disclaimer: Record reviews are a tricky business. It's one thing to enjoy music, but to pick out what you like (or dislike) about it? That being said, if I review your thing and I didn't like something, don't feel too bad. My opinion doesn't matter all that much. 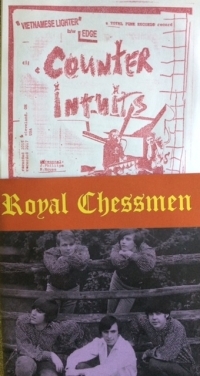 Counter Intuits - Vietnamese Lighter - Total Punk Records - 2 songs - 7"
Royal Chessmen - Don't Tread On Me - My Mind's Eye / B-W Records - 2 songs - 7"